Note: You can enter this giveaway three (3) times per e-mail address per day. Deadline is 11:59PM ET 8.24.18. Whether you’re a fry guy or a gal who appreciates Southern Fried Chicken Wings, you can now enjoy your favorite fried foods with less guilt. The Big Boss Oil-Less Fryer allows you to make all those favorites and more with fewer calories than if you had used a traditional deep fryer while retaining all the flavor and moisture of the food. The unit features the triple-cooking power of halogen, convection, and infrared heat and quickly cooks food from frozen – no thawing needed, saving you time. 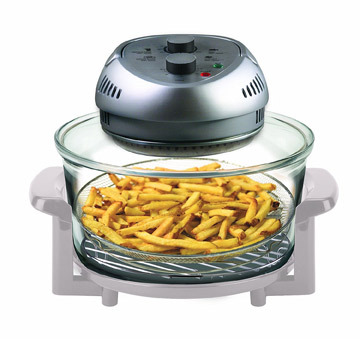 It also has two trays so you can cook multiple foods simultaneously – meat, poultry, vegetables or even dessert. NO PURCHASE NECESSARY TO ENTER OR WIN. Void where prohibited by law. Open to legal residents of the 50 U.S., D.C. and Canada (excluding Quebec) who are at least eighteen years old at the time of entry and have internet access. Begins on 6.28.18 at 12:00:00 a.m. ET and ends on 8.24.18 at 11:59:59 p.m. ET. To enter the giveaway, submit your full name and email address on this form. Odds of winning this giveaway depend on the total number of eligible entries received. Only three (3) entries per email address per day. Sponsored by Leite’s Culinaria, Inc. For more information, visit our Official Rules. For a list of winners, check out our Very Happy Winners page. Be sure to add giveaways@leitesculinaria.com to ensure notification if you are the winner.